李崇银, 黎鑫, 杨辉, 等. 2018. 热带太平洋-印度洋海温联合模及其气候影响 [J]. 大气科学, 42(3): 505-523. Li Chongyin, Li Xin, Yang Hui, et al. 2018. 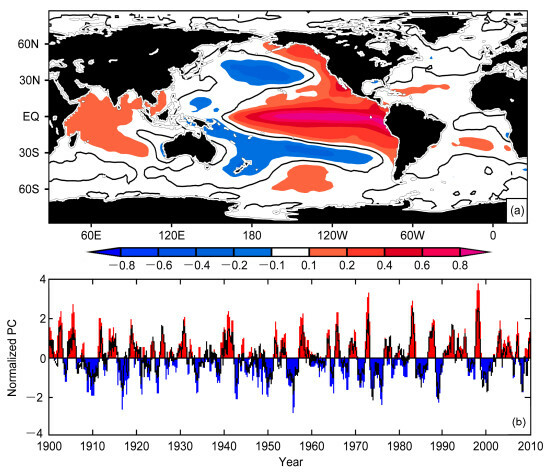 Tropical Pacific-Indian Ocean Associated Mode and Its Climatic Impacts [J]. 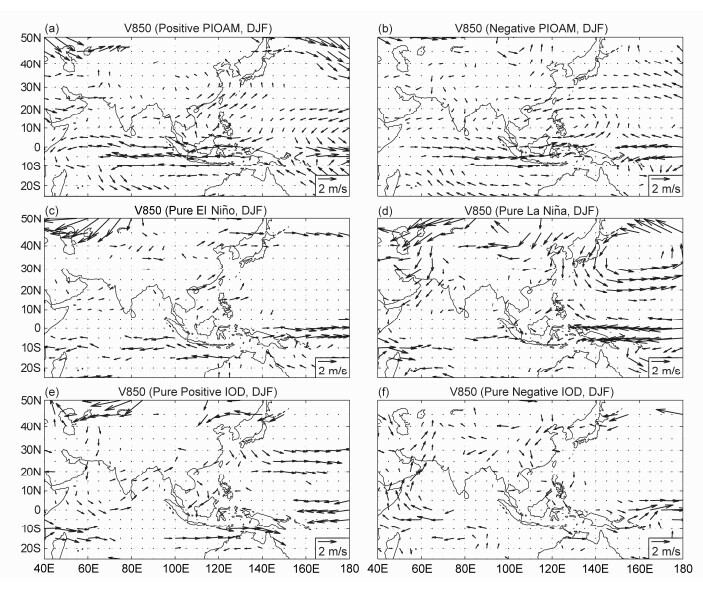 Chinese Journal of Atmospheric Sciences (in Chinese), 42(3): 505-523, doi:10.3878/j.issn.1006-9895.1712.17253. Abstract: Based on observational data and simulation results by LICOM2.0 model, a synthetic introduction with regard to the existence, feature, evolution and impacts of the Pacific-Indian Ocean associated mode (PIOAM) are given in this paper. 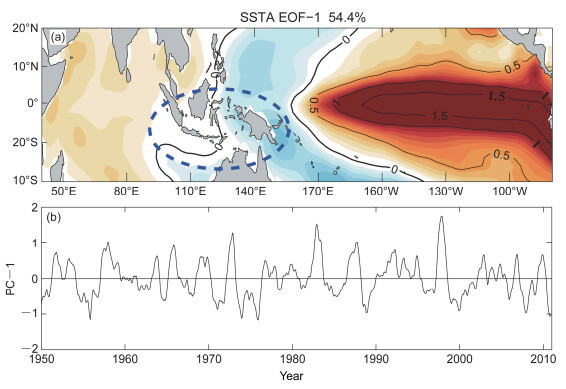 EOF analyses of SSTA both in the tropical Pacific-Indian Ocean and in the global ocean show that the EOF-1 pattern in the tropical Pacific-Indian Ocean is perfectly similar to the PIOAM, which indicates that the PIOAM is a very real mode of oceanic temperature anomalies in the tropical Pacific-Indian Ocean. 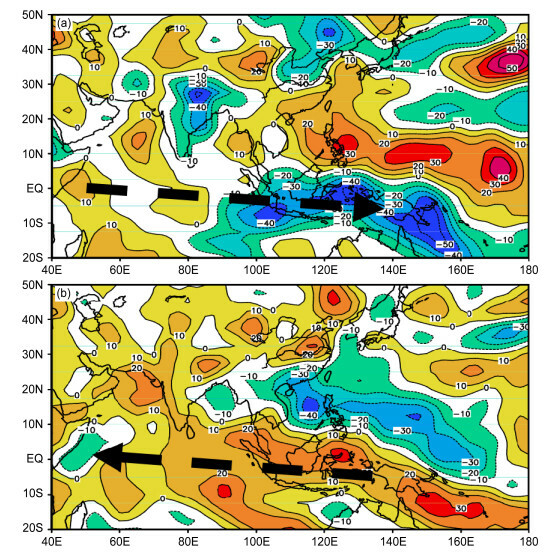 Corresponding to positive and negative phases of the PIOAM, the wind field anomalies at 850 hPa over the tropical Pacific-Indian Ocean in the summer (JJA) are almost opposite, the Walker circulation at the lower troposphere and the Asian summer monsoon display different anomalous (close to opposite) features. In positive (negative) phase of the PIOAM, the South Asia high is located to the east (west) of its normal position. 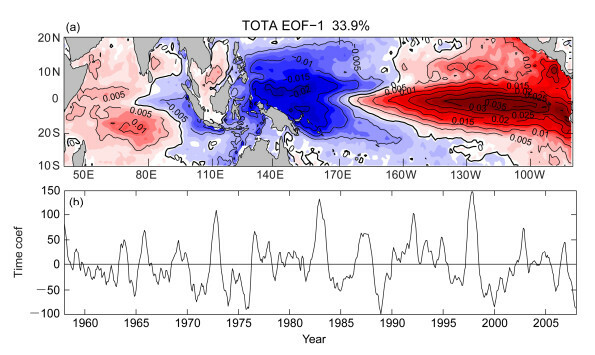 EOF analyses of subsurface oceanic temperature anomalies (SOTA) at the thermocline camber in the tropical Pacific-Indian Ocean reveals that the EOF-1 is a triangle mode similar to the PIOAM at the sea surface. This result suggests that the PIOAM also occurs in the oceanic subsurface. The numerical simulation by the high resolution oceanic circulation model LICOM2.0 shows that when the tropical central-western Indian Ocean and central-eastern Pacific are abnormally warmer/colder, the tropical eastern Indian Ocean and western Pacific are correspondingly colder/warmer. 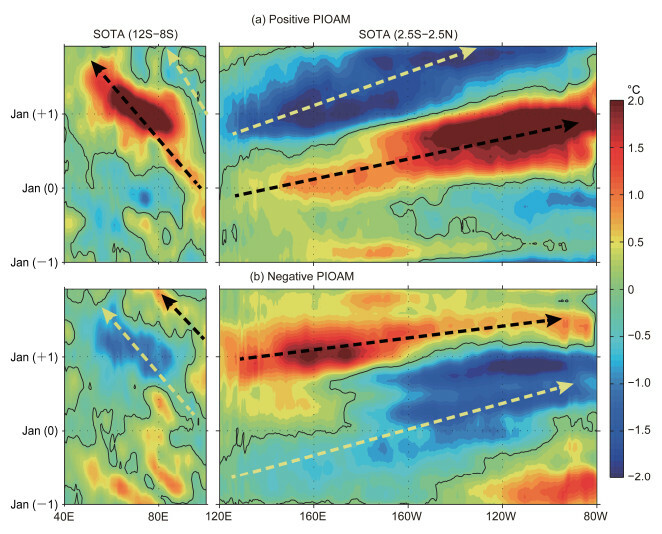 This result further confirms that the tropical PIOAM is an important mode that is significant in both sea surface temperature anomaly (SSTA) field and subsurface ocean temperature anomaly (SOTA) field. 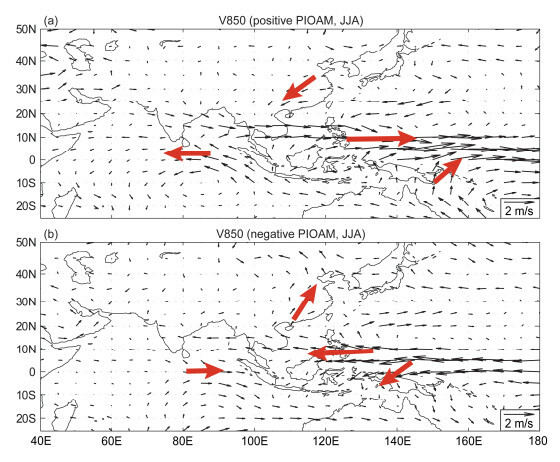 The positive and negative phases of the PIOAM not only affect the weather/climate in Asian and west Pacific regions, but also have impacts in south-north American and Africa regions. 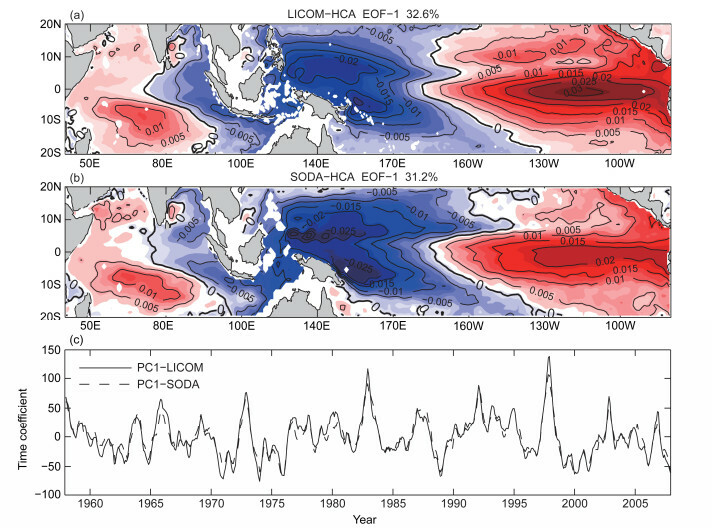 The influences of the PIOAM are different from that of ENSO and Indian Ocean Dipole (IOD). Li C Y, Mu M Q. 2001. 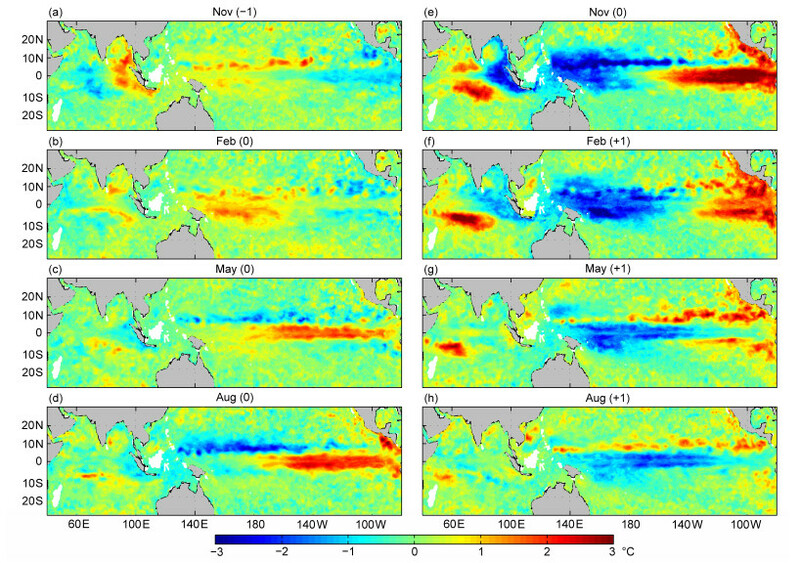 The influence of the Indian Ocean dipole on atmospheric circulation and climate [J]. Advances in Atmospheric Sciences, 18: 831-843. Li C Y, Mu M Q. 2002. 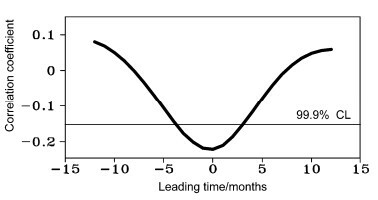 A further study of the essence of ENSO [J]. Chinese J. Atmos. Sci., 26: 309-328. 黎鑫. 2015. 热带太平洋-印度洋次表层海温联合演变特征及其气候影响[D]. 中国人民解放军理工大学博士学位论文, 165pp. Li Xin. 2015. The joint evolution of subsurface ocean temperature in tropical Indo-Pacific and its climate impacts[D]. Ph. D. dissertation (in Chinese), PLA University of Science and Technology, 165 pp. Liu H L, Lin P F, Yu Y Q, et al. 2014a. 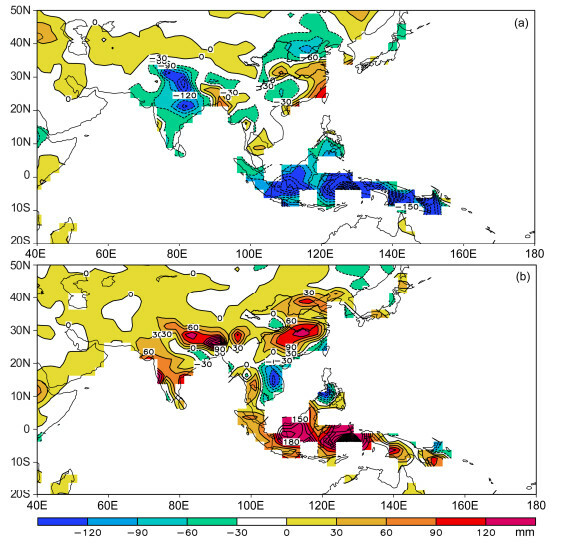 LASG/IAP climate system ocean model version 2: LICOM2[M]//Zhou Tianjun, Yu Yongqiang, Liu Yimin, et al. Flexible Global Ocean-Atmosphere-Land System Model. Berlin, Heidelberg: Springer-Verlag, doi: 10.1007/978-3-642-41801-3_3. Liu H L, Yu Y Q, Lin P F, et al. 2014b. High-Resolution LICOM[M]//Zhou Tianjun, Yu Yongqiang, Liu Yimin, et al. 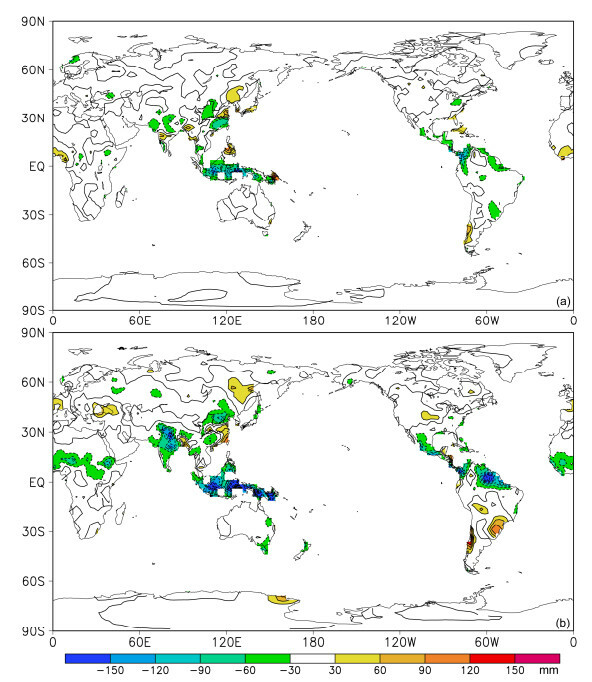 Flexible Global Ocean-Atmosphere-Land System Model. Berlin, Heidelberg: Springer-Verlag, doi: 10.1007/978-3-642-41801-3_38. Saji N H, Goswami B N, Vinayachandran P N, et al. 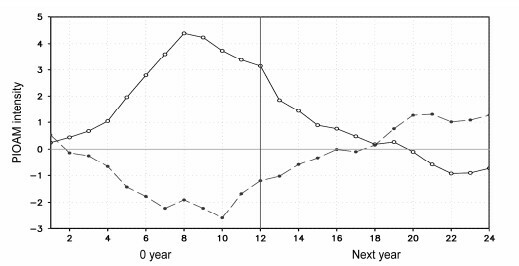 1999. , A dipole mode in the tropical Indian Ocean [J]. Nature, 401(6751): 360-3. 臧恒范, 王绍武. 1984. 赤道东太平洋水温对低纬大气环流的影响[J]. 海洋学报, 6(1): 16-24. Zang Hengfan, Wang Shaowu. 1984. 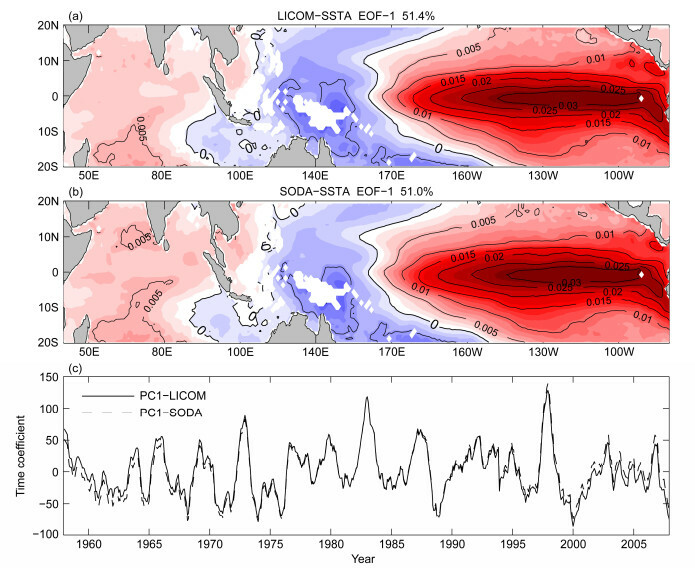 The influence of equatorial eastern Pacific Ocean temperature on atmospheric circulation in the lower latitudes (in Chinese)[J]. Acta. Oceanol. Sin. (in Chinese), 6(1): 16-24.